With the development of the Ford Mustang Shelby GT500 in the bag and its official on-sale date on the horizon, Ford has turned its attention to the base 2.3-liter EcoBoost Mustang and cooked up the new High-Performance package for the 2020 model year. It was inspired by an in-house one-off Mustang build featuring a Focus RS engine, and the build proved to be so entertaining that the Mustang team submitted a formal plan to migrate it into the production lineup. To get things started, Ford confirmed production availability of the Valencia, Spain-built turbocharged 2.3-liter engine from the Focus RS. Desirable for its die-cast alloy block and high-performance extra-strength cylinder head, it required a bit of engineering to utilize it for a rear-wheel-drive-only setting. While they were at it, Ford tweaked the head gasket, specified a 5 percent larger 63-mm twin-scroll turbo compressor and a larger radiator. Completed, the engine is rated for 330 horsepower; that's 20 ponies shy of the 350-hp tune as utilized in the Focus RS application but 20 more than the 310-hp version of the 2.3-liter EcoBoost in the 2019 Mustang. Torque is unchanged at 350 lb-ft, the same in all three cars. Ford also strived to broaden the torque curve, which now delivers 90 percent of its peak from 2500 rpm all the way to 5300 rpm, a claimed 40 percent wider spread than that of the standard 2.3-liter Mustang engine. Ford said the horsepower curve also benefits, staying stronger as the engine nears the 6500-rpm redline. The engine can be mated to either the six-speed Getrag manual or 10-speed automatic transmission, and as with the previous Performance Pack, a 3.55:1 limited-slip rear axle resides out back. A fully active quad-tip exhaust is included as part of the package. While the final numbers aren't in yet, Ford is claiming zero-to-60-mph times in the mid-four-second range on premium fuel, which is about a half a second quicker than we recorded with the 2019 Chevrolet Camaro Turbo 1LE. We're certain that's no coincidence, and you can bet Ford had the Turbo 1LE in its sights from the start of the project. For good measure, Ford has lifted the speed limiter to 155 mph, a 10-mph increase over the previous Performance package and a 34-mph increase over the standard Mustang EcoBoost. Ford added numerous tweaks and upgraded several components to ensure the chassis can hold up its end of the bargain. An alloy strut tower brace stiffens up the chassis at the front and sharpens turn-in, while a 1.3-inch solid front roll bar and a tubular 0.9-inch bar at the rear help control lean and sway. A set of 13.9-inch front rotors come by way of the Mustang GT, and four-piston calipers reside at each wheel. Package-specific 19-by-9-inch machined-face aluminum wheels and 255/40R summer tires comprise the rolling stock, and to make sure the hardware is performing at its best, Ford tricked up new specific calibrations for the electronically controlled power steering, anti-lock braking, stability control, and five driver-selectable drive modes. A large black front splitter and belly pan, plus brake cooling ramps from the Mustang GT Performance package, work to reduce front-end lift and improve brake cooling. A blacked-out grille with offset Mustang tri-bar pony emblem, 2.3-liter High Performance package side badges, hood stripes, magnetic gray side mirrors, and a raised blade rear spoiler all come along with the High Performance package. Inside, a serialized dash plaque and an engine-spun aluminum instrument panel add to the performance theme. Track rats clamoring for even more grip can select the available EcoBoost Handling package as an add-on to the High Performance package. Featuring specially calibrated MagneRide dampers and a Torsen 3.55:1 limited-slip rear axle, it also includes wider 19-by-9.5-inch premium painted aluminum wheels wrapped with 265/40R Pirelli P Zero Corsa4 summer tires with a 0.9-inch solid rear sway bar. Available with either the manual or automatic transmission, the EcoBoost Handling package is exclusive to the coupe. 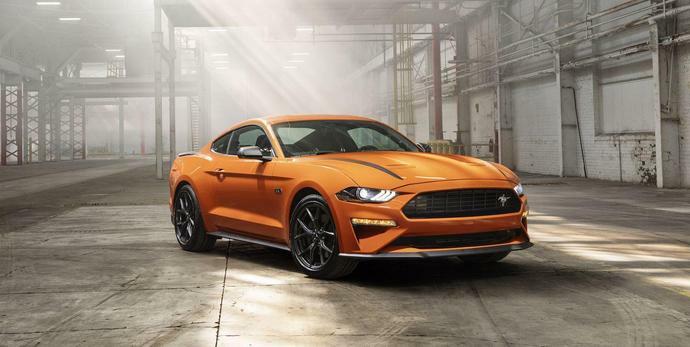 Finally, the arrival of the High Performance pack ushers in four new exterior colors for 2020 Mustangs: Grabber Lime, Iconic Silver, Red Hot Metallic Tinted Clearcoat, and Twister Orange. Ford hasn't released any pricing yet but did say the 2020 Mustang 2.3-liter EcoBoost with the Performance package will begin arriving in dealerships in the fall. We'll bring on-sale information when we get it; try to be patient until then. The Mustang car takes a bow at the New York Auto Show and around the country. April 17 is its big day.